Mattey was on student council this year. 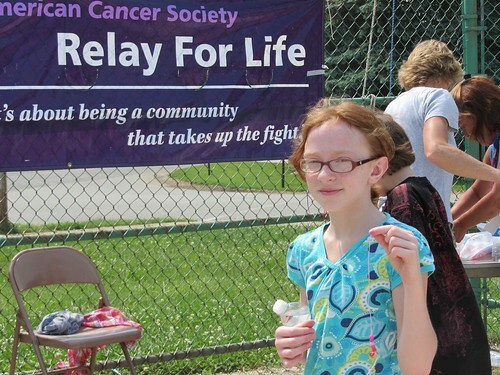 For an end of the year activity they planned to have a mini Relay for Life. At different times throughout the morning all the school participated. This is a great way to bring the school together to support fighting cancer. Too bad the temperature was supposed to get up in the mid 90s today. Yuck. Kade's class walked at 9:30 but I was going to be hanging with his class for field day later so I didn't go. I did walk walk with Mat and her class at 11:30. It was hot and dusty since we walked laps on the ball diamond. After every lap each child, and some parents, got a bead to go on a bracelet. Luckily when the 4th graders were done they could go in, clean up a little, and enjoy lunch. Here's Mattey finishing a lap and had just strung her bead.